Starting this season there will be only one class: LM P1 (Le Mans Prototype 1). It includes the prototypes without energy recovery systems (ERS) and prototypes with ERS. 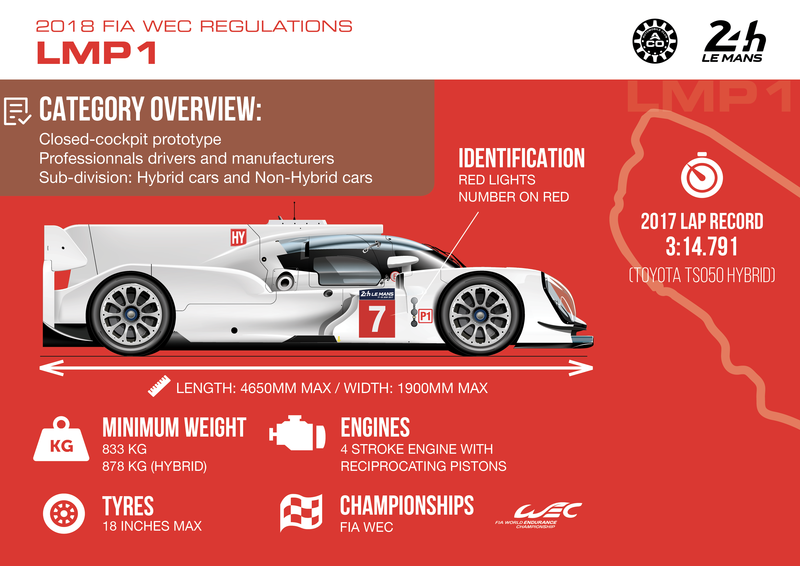 The level of performance of the current non-hybrid prototypes governed by the technological equivalences will be aligned on the current LM P1 hybrid regulations to enable the highest number of entrants to access this category for the 2018-2019 season. The first sporting measure taken is that the LM P1 World Championship title will be awarded to teams and not to manufacturers to enable newcomers to take the fight to Toyota in one category – LM P1. Constructors of non-hybrid cars and engines had to send in their chassis and engine performance data at the end of 2017. An allocation of fuel has been calculated from them as it is this factor that decides the power output of an engine in LM P1, the aim being to give their car a theoretical identical performance to that of the hybrid cars (the yardstick used was Toyota at Le Mans in 2017). To achieve these levels of performance more easily non-hybrid LM P1s will be able to take advantage of less restrictive aerodynamic regulations than the hybrids (additional downforce, bigger rear wing, bigger diffuser and a more efficient front splitter). As the chassis is the same as in LM P2, it’s possible to use an LM P2 chassis as a base provided it is modified to comply with the LM P1 regulations (aerodynamics, length etc). As fuel limitations could be advantageous to the turbocharged or normally-aspirated engines in the non-hybrid LM P1s, an adjustment will be made between the two types of engine to guarantee their competitiveness. To continue to promote hybrid technology the capacity of the fuel tanks have been defined so that the hybrid cars cover one more lap than the non hybrids at Le Mans, the only advantage given to them by the regulations. Thus, during the coming Le Mans 24 Hours non-hybrid cars will cover 10 laps per stint and the Toyotas eleven with 33% less fuel. It’s a telling demonstration of the results obtained thanks to the hybrid regulations in the FIA WEC! The selection committee has retained 10 LM P1s for the 2018 race, including two hybrids entered by Toyota, the only manufacturer in the blue-riband category, which will face opposition from eight non-hybrid cars entered by five private teams. This is a success for the options chosen by the ACO and the FIA in their LM P1 strategy as they have attracted Rebellion Racing, Bykolles Racing team, CEFC TRSM Racing, Dragon Speed and SMP Racing, as well as well-known drivers like André Lotterer and young Thomas Laurent, a rising star in endurance, and a perfect illustration of the driver ladder so dear to the heart of the ACO. So whoever wins this category will score a historic victory! If Toyota comes out on top it will be a first for the Japanese manufacturer which has always proved its “fighting spirit” and its unflagging commitment to the Sarthe event despite rivals, bad luck and this circuit that is merciless on the cars. This year Toyota will be back at Le Mans for the 20th time in its quest to win the ultimate prize. If victory goes to Toyota and the driver line-up compromising Alonso-Buemi- Nakajima it will also be a remarkable first with the win of a rookie who is also a double F1 world champion. And last but not least, if the 2018 race is won by one of the private teams entered in LM P1 it will be yet another first for the team in question as well as an unprecedented achievement! It will also be a perfect illustration of the spirit of the greatest of endurance races whose aim is to ensure that every entrant starts on a level playing field and that its regulations have facilitated the construction of fast cars. So even before the start on 16th June at 15:00 one thing is certain: the scenario in the LM P1 category promises a never-before-seen battle. In 2017, new regulations were brought in in LM P2 and four chassis constructors were selected Oreca, Onroak Automotive, Dallara and Riley-Multilmatic (closed cars obligatory) and a single engine, the 4.2-litre V8 Gibson, in order to cap costs in this category aimed at private teams. 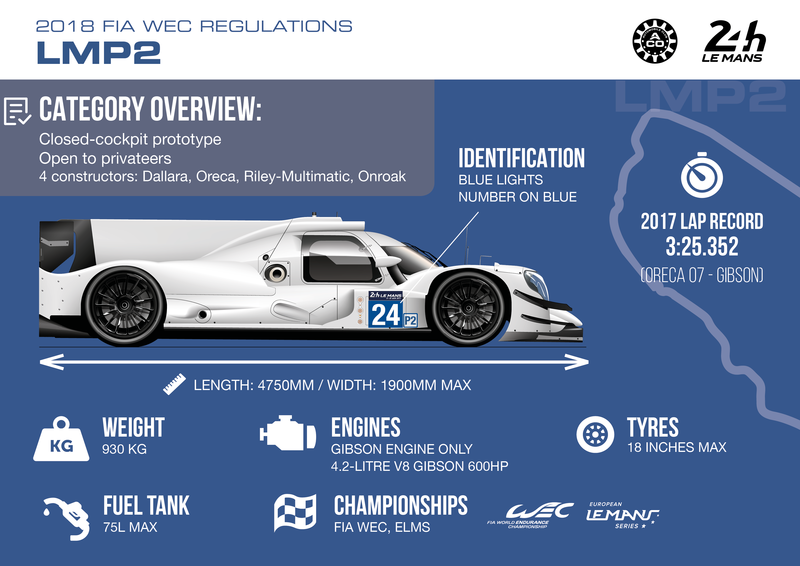 The main features of the 2018 season in LM P2 will be development and continuity with only a few adjustments foreseen to the new regulations introduced last year. It was agreed that if a car proved to be down on speed the constructor would be authorised to make some modifications to its chassis for season 2. This option has been taken up by Dallara, Ligier and Riley-Multimatic (reserve at Le Mans) to try and achieve the same level of performance as the Oreca 07s. The latest car from the design department of the Var-based constructor had an outstanding season in 2017. It helped Vaillante Rebellion Racing to the FIA World Endurance Championship LM P2 title, won the category in the Le Mans 24 Hours with Jackie Chan DC Racing with a double and second place overall, as well as the ELMS title with G-Drive Racing with DragonSpeed. 2017 was a record year for LM P2 with 25 cars entered for the Le Mans 24 Hours and they achieved stunning performances as lap times improved by over 10 seconds compared to the P2s in 2016. Ligier beats Orecas in the numbers game! The category has continued to meet with success in 2018 with 20 LM P2s entered for Le Mans including 8 Orecas, one of which is running under the Alpine moniker, 3 Dallaras and 9 Ligiers. One Riley is on the reserve list. In 2018, the winner of the Sarthe Classic in 2017, Jackie Chan DC Racing, is back to defend its Le Mans title unlike last year’s world endurance champion, Rebellion Racing, which has moved up to LM P1 this season. However, the Chinese team will be up against tough opposition from sister Oreca 07s run by DragonSpeed, Signatech Alpine, TDS, G-Drive and Graff among others, and the Racing For Holland and SMP Dallaras as well as the Ligiers, which out-number all the other makes. Teams running them include Panis Barthez Competition, IDEC Sport, United Autosports, Larbre Competition and Jackie Chan DC Racing! The cards have been reshuffled ensuring that the battle in the LM P2 category will be yet another hotly-disputed one. The list of reserves includes nine teams, six in the LM P2 category and three in LM GTE Am. A Riley is one of the reserves in LM P2. They will be allowed to race following the order on the list should one of the other entrants withdraw. It’s like a real motor show – almost! 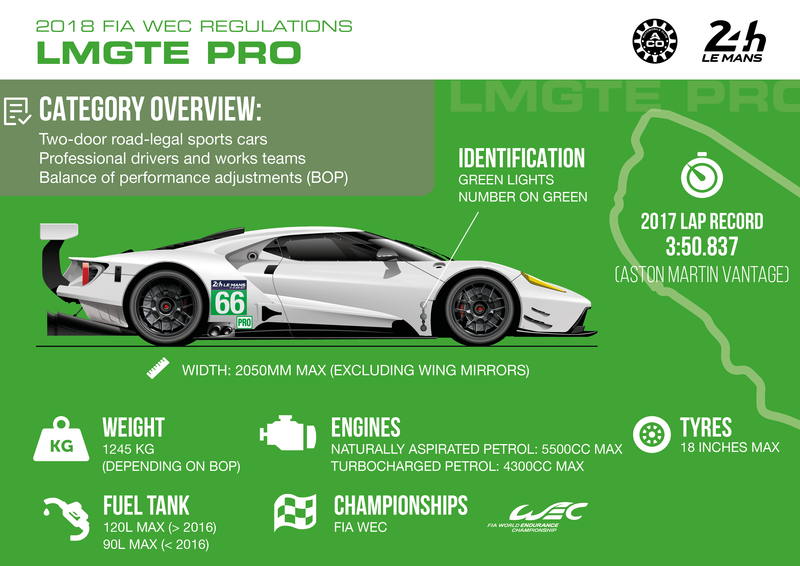 LM GTE Pro has attracted no fewer than six manufacturers from among the biggest names in the motor car industry: Ferrari, Porsche, Aston Martin with its new car, the AMR Vantage, Ford, Chevrolet Corvette and BMW making its return to endurance with the fabulous M8. All in all a mouth-watering field with 17 cars, which promises a no-holds-barred battle as victory in this class is so important for a manufacturer. In LM P1 the cars are out-and-out prototypes, while in GTE Pro they are derived from series production models so promoting the make and the car is a much more direct operation. Each manufacturer has invested the necessary resources for the 86th event by entering at least two cars. Porsche and Ford have a slight numerical advantage with four each. Ferrari has three while the other three Chevrolet Corvette, BMW and Aston Martin have each entered two. To win the endurance classic in this category the manufacturers generally call on top-class drivers as the closely-fought battles in LM GTE Pro require specific skills. Porsche has entered no fewer than four 911s, proof of the renown of the make thanks to endurance, and has recreated the magic duo Romain Dumas-Timo Bernhard, both outright winners of the Le Mans 24 Hours in the blue-riband category with Audi and Porsche, who are also very experienced GT drivers. All the category regulars are present like Marco Sorensen, the first driver nominated on the no. 95 AMR Vantage, Patrick Pilet (Porsche), Tony Vilander (Ferrari) and Andy Priaulx (Ford). In the BMW camp the first-nominated drivers are Martin Tomczyk and Augusto Farfus. Aston Martin, BMW, Porsche, AF Corse, Ford Chip Ganassi and Corvette Racing GM have entered the following cars: Vantages, M8s, 911 RSRs, 488s, GTs and C7Rs. A quick look back at the mind-boggling finish to last year’s Le Mans 24 Hours with Aston Martin‘s incredible victory in the final metres promises that this year’s scrap in June will be just as intense. With the presence of two new cars, the Vantage and the M8, suspense is guaranteed given the overall level of the entries in this category. With such a field it will take an inspired guess to predict the category winner! The aim of the spirit of the Le Mans 24 Hours is to ensure that manufacturers as well as privateers can lock horns with each other on the same circuit, and that professional and amateur drivers can measure themselves against one another in the greatest of endurance races. This year there will be 13 LM GTE Am cars on the grid at the start on 16th June comprising 6 Porsches, 5 Ferraris and 2 Aston Martin Vantages. Regulars or guests like Dempsey Proton Racing, Proton Competition, Gulf Racing, TF Sport, Aston Martin Racing, JMW Motorsport, Ebimotors, Spirit of Race, Team Project 1, MR Racing, Keating Motorsports and Clearwater will provide a thrilling spectacle in this category in which a classification of drivers is imposed to ensure that amateurs have their place on the entry list. All the teams will defend their chances right till the end of the Le Mans 24 Hours and JMW Motorsport, the defending champion with Liam Grieffin as the first nominated driver, will be up against tough opposition. 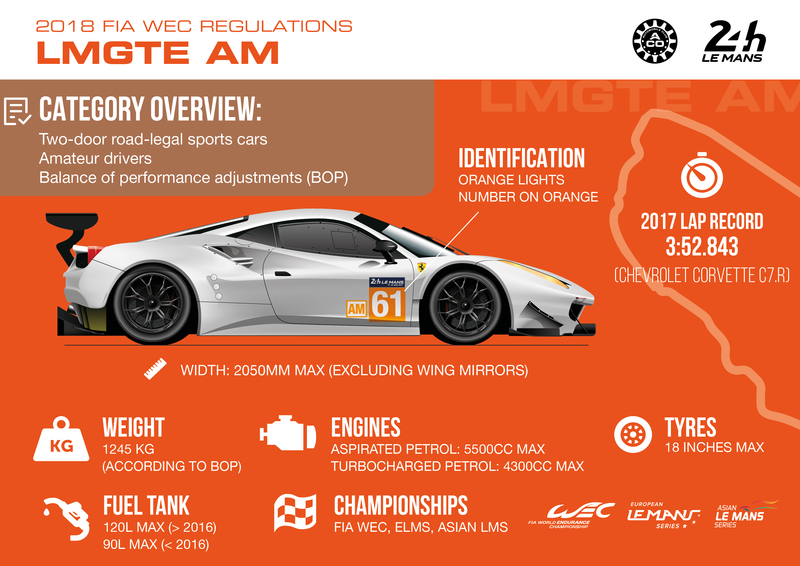 The list of reserves comprises nine teams, six in the LM P2 category and three Ferrari 488 GTEs in LM GTE Am. They will be allowed to race following the order on the list should one of the other entrants withdraw.